Our Giving Back Committee is dedicated to making a difference in the local area through charitable donations and volunteer efforts. 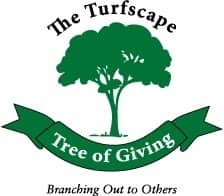 What started in 2004 as a golf outing to benefit the Akron Children’s Hospital Burn Unit has evolved into the Turfscape Tree of Giving. Our endeavors range from charitable donations… to a full day of volunteering… to ongoing support of an organization! There are no boundaries when it comes to Turfscape Giving Back to the surrounding community as you can see in the sampling of our efforts below. Created a landscape slide for the children at HUDSON MONTESSORI SCHOOL. Donated money to the American Red Cross for HURRICANE HARVEY AND HURRICANE IRMA VICTIMS. Turfscape matched every dollar raised resulting in a $2,000 donation! Performed a complete overhaul of TRINITY HIGH SCHOOL'S landscaping. Planted a tree with the students of Hilton Elementary in Brecksville for EARTH DAY. Raised money for and participated in SUSAN G. KOMEN’S RACE FOR THE CURE and painted a trailer and plow truck pink in support of breast cancer awareness. Beautified the grounds at TRINITY UNITED CHURCH OF CHRIST. Volunteer at the AKRON-CANTON REGIONAL FOODBANK by sorting cans and perishables a couple times a year. Support KEEP AKRON BEAUTIFUL and Adopt-A-Site each year. Revamped the dog enrichment area at PAWSIBILITIES HUMANE SOCIETY OF GREATER AKRON. Participate in GREENCARE & SNOWCARE FOR TROOPS and provide complimentary landscape & snow removal services for a family with a currently deployed member. During the Holiday season we have donated to less fortunate families through: ADOPT-A-FAMILY, COATS FOR KIDS and AKRON CATHOLIC WORKER HOUSE CLOTHING DRIVE. Participated in MOVEMBER and grew mustaches (those of us that could!) to help raise awareness for prostate cancer. Repaired the tornado damage at Secrest Arboretum for PLANET DAY OF SERVICE. Hosted a Golf Classic and participated in “Have a Heart, Do Your Part” radiothon – both benefiting AKRON CHILDREN’S HOSPITAL. We are continually looking for ways to improve our community by offering our landscaping expertise or volunteering in a variety of ways. If you know of a property or organization that is in dire need of relief, we would love to hear from you.